Emergency escape life hammers are great for use at home, in the car or for office use. Escape Hammer helps you escape from a dangerous vehicle, quickly and easily. Auto escape hammer features double steel-pointed tips to break through windows and safety razor blade to cut easily through seatbelts. 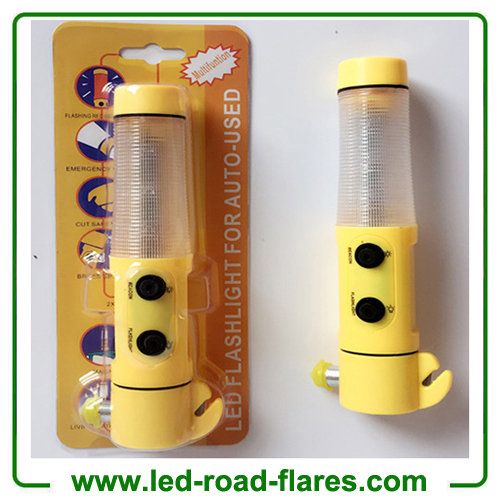 Led Flashlight makes the car window breaker easy to locate in case of car accident or emergency situations. Keep this lifesaving auto escape hammer tools in your car in case of an accident. How to use Emergency Escape Life Hammer? What Should I have Emergency Escape Life Hammer? This is a great question! You want an emergency escape hammer that won’t fail in the event of that serious collision that leaves you trapped inside. Today's car design has evolved to include more safety measures to better protect drivers and passengers from the dangers of frontal impact. But some of these measures can consequently lead to more complications just by virtue of their functions. Probably the best example of this is your car's “crumple zones”, which alone is reason enough to always have your slammer hammer ready, on-hand at all times! Vehicular crumple zones are triggered by fast, head-on frontal collisions. Upon impact, a car can immediately collapse in certain sections, which essentially used to protect drivers and passengers from the impact. While this feature certainly has its positives, it can unfortunately cause your doors to jam, leaving you trapped inside! Furthermore, a sudden collision can kill your car's battery, leaving you powerless to open your door without the aid of an emergency window breaker. Even your own seat belt can jam and malfunction during a frightening rollover collision, making it nearly impossible for drivers to release themselves as well. In the event that you're trapped inside, Emergency Escape Hammer is specially designed to break your car's tempered glass. Fortunately both children and adults can easily use the Emergency Escape Hammer since it doesn’t require much strength to use. The Emergency Escape Hammer even features a special seat belt cutter too! This cuts through the harness of both your seat belts and child safety seats, allowing you to immediately free yourself and your child. 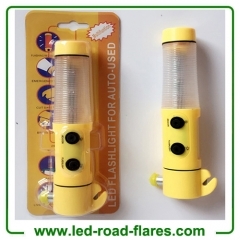 Plus, if you're involved in a dangerous collision at night, the Emergency Escape Hammer even features a special flashlight so you're not fumbling around in the dark trying to release yourself.